We are breeding according to the guidelines of TICA and pure Savannah x Savannah with the aim to further develop the breed of Savannah Cats. 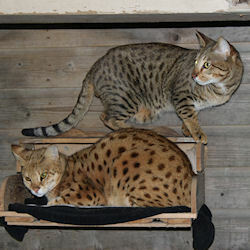 We have set the bar high and want to breed almost perfect Savannah Cats. If everything is fine, we may occasionally enjoy a beautiful litter of kittens, who grow up with great care and love, before they go to their new owner. In addition to our Savannah Cats, we also have 2 Sibannah Cats and our stunning guard dog Ebro, a Dobermann. We value the health of our animals, so they are regularly examined by the veterinarian, inoculated and tested. The plan is, that our Queens get a litter of kittens once a year, which grown up in our own house. Our kittens leave the house after fourteen weeks and then they are grafted second times and wormed several times. The new owner gets a proof of the family tree of course. We do not permit, that the kittens, we breed with love, can run free outside. The kittens must be prevent for getting hit by a car, or get stolen, or get cat aids or other diseases. You should have an indoor and outdoor catrun for your Savannah Cat, so he or she can go outside, whenever they want. Movement for a Savannah Cat is very important, it is an active cat, who also like, when they just can pull back. How big is a Savannah? There are many stories about so-called big cats, which are imported from America. That’s why, there is an image, that a Savannah Cat could get as big as a Cougar or even bigger. This is incorrect. There are, however, large specimen Savannah Cats. It is about how much percentage of Serval blood is left in the Savannah. The higher the percentage of Serval blood, the bigger he or she is. So by definition an F1 Savannah is larger than an F2 and so on. Also between a Savannah male and a female, there is a significant difference. A male F2 or F3 is bigger than a regular domestic cat. The females are generally slightly larger as regular domestic cats. F1 and F2 usually have a weight between 8 and 11 kg. The F3 and F4 males can also still be 7 kg. Savannah Cats are slow growers and have only on their 3rd year of life the full height and weight. F1 male can be between 40 and 45 cm Withers height (at approx. 53 – 56% Serval). F1 male with a percentage of 75 – 77% can almost reach a height of 60 cm. F1 female and F2 male between 35 and 40 cm. F2 female and F3 male between 30 and 35 cm. F3 female, F4 female, male and F5 female and male have the same size as a domestic cat. Of course there are deviations in the above weights and measures. It can not to guaranteed in advance, how big a female or male wil get. If there are any questions, click on Contact. Price for a kitten click HERE. Any questions or interest in reserving a Savannah kitten?